With a tight schedule of shopping, decorating and, oh yeah, our normal everyday lives, getting all dolled up for a holiday party is at the bottom of our to-do list. Instead of trying to schedule in a last-minute blowout, take a simple style, like the ponytail, and do it yourself. With a simple twist or braid, you can jazz it up in a time crunch. The braid and the ponytail — both simple and classic on their own. Together, they’re captivating. 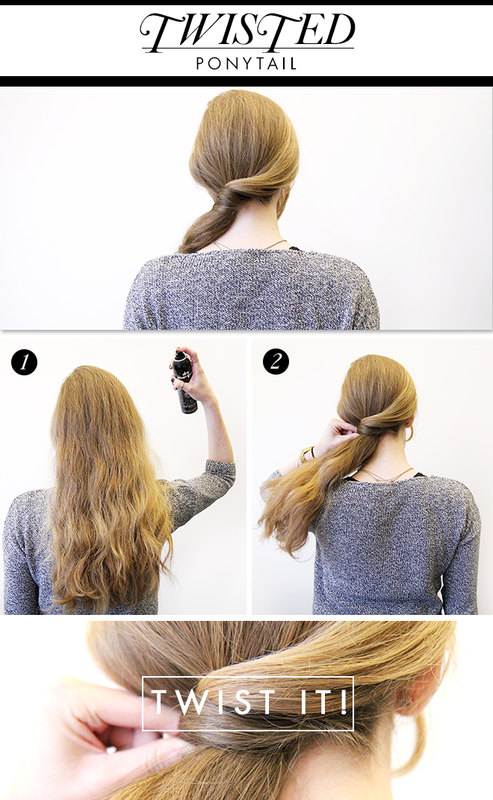 Update a simple ponytail with a wrap-around braid at the base. Got some extra time? Play it up even more with a French braid along the hairline. Step 1: Separate the hair into two sections on an angle with the right side thicker than the left. Step 2: Pull the right side into a ponytail directly in the center of the head. Step 3: Start to French braid the left side. Step 4: Continue the braid all the way down the hair and secure the end with an elastic. Step 5: Wrap the braid around the ponytail’s elastic, pinning it in place with bobby pins. Seen all over the red carpet on the likes of Blake Lively and Jennifer Morrison, the segmented ponytail is both elegant and edgy. Step 1: Gather about an inch of hair at the top of the head, keeping it in place with an elastic. Use a small section of hair from the mini ponytail and wrap it around the elastic to hide it. Pin in place with bobby pins. Step 2: Gather another section of hair, creating a second mini ponytail. Again, use a section of hair to wrap around the elastic. Step 3: Use your fingertips to tug on the hair between the ponytails. This creates subtle volume. Step 4: Continue step 2 two more times, the second time gathering all of the hair into a complete ponytail. Hide the elastic with a piece of hair and keep in place with bobby pins. Step 5: Create segments in the base ponytail, moving down to the tip. Hide each elastic with a strand of hair. The easiest way to dress up your pony? Twist it. This style not only adds a party in the back, but it creates height on top with little product and no teasing required. Step 1: Use dry shampoo to create rough texture. We used New York Streets Dry Shampoo ($17, newyork-streets.com) all over the hair. Not only does it have an amazing floral scent (you seriously won’t need perfume), but it adds moisture and doesn’t leave a white residue. Quick Tip: If your hair is very thin, create loose waves with a curling iron to get that same texture. Step 2: Gather all of the hair on the right side and twist it to the left, pushing it up as you twist to add height. Pin in place with bobby pins. Quick Tip: For thinner hair, the best way to get that exaggerated twist is by twisting the top section and pinning. Then finish by twisting the bottom and pinning.